Sony KDL-40W605B review | What Hi-Fi? 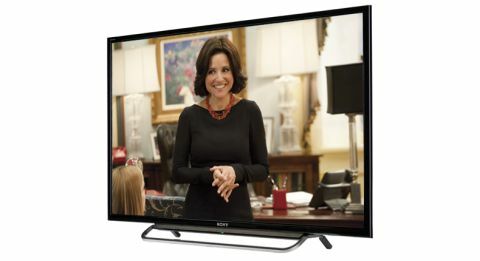 Is the Sony KDL-40W605B one of the best-value TVs of 2014? With full smart features and a great interface accompanying a stunning screen for just £450, it could well be. We've already given the KDL-40W605B a five-star review, but it's time to see if the 40in TV holds up against it latest class rivals. We find a sharp, clean picture when we turn on Come Dine With Me (in HD). Detailed and clear, sushi pieces have texture, as does upholstery on furniture. Even small grains of couscous have a detectable outline, while skin tones look natural and colours are deep and rich. Switching to the SD version and the Freeview HD tuner proves to be a decent upscaler when handling standard-definition material to fill the Full HD screen. The picture loses some sharpness, as expected, but is still clean, crisp and well balanced. We play the Captain Phillips Blu-ray and it’s not long before we’re lost in the action. It is a rich, detailed and subtle experience. Motion is smooth, too, as the Somalian pirates’ speedboat rips through the waves. The rich colour palette of HD broadcasts transfers to the Blu-ray, although it’s worth experimenting with the colour modes and temperatures. Blacks are intense, whether it’s from Tom Hanks’s binoculars or the ship’s underbelly. A little detail is forsaken in return – faces often have shadows in low-light scenes – but it’s a compromise we can accept for truly arresting blacks, although Samsung's UE40H6400 is able to dig out a smidge more detail in the shadows. Like most budget TVs, sound isn’t much to shout about. It’s fast and detailed, but lacks weight and can sound bright (especially at higher volumes). The purchase of a soundbar – like the Philips HTL5120 – will give a helping hand here, though. The KDL-40W605B is an unassuming, yet smart package: its thin, glossy, black bezel is nicely rounded at the edges. It’s very light too, weighing under 8kg and supported on a metal rectangular stand. It’s sturdy and well built, although not as slimline as one might assume. The bottom of the back panel is slightly bulky but it has four HDMI (one including ARC channel) and two USB inputs. There’s also a Scart, component and composite input each, as well as digital optical and headphone outputs. A LAN socket, too, provides a wired internet connection, although the Sony can be connected wirelessly, too. Load the Sony Entertainment Network – the online smart portal – and BBC iPlayer, Netflix and YouTube are all here, with Demand 5, Amazon Instant Video sitting alongside pre-installed weather, news and gaming apps. Sony’s own music and video streaming service is on deck, too, as is its Football Mode, which brings up popular YouTube football videos and activates the Sport picture mode and surround sound. We’d keep it turned off, though, unless you’re partial to a packed stadium sounding screechy and loud. Sony’s Social View is worth looking at too if you like to keep up with gossip on, say, your favourite TV series: a scrolling Twitter feed relating to the programme you’re watching (or any keyword you enter) runs along the bottom of the screen. It’s not too invasive and one of the more functional approaches to social integration we’ve seen this year. The new One-Flick Entertainment interface is a delight, too. Attractive and intuitive, its full-screen, grid-formatted menus are much easier to navigate than the previous XrossMediaBar interface. Content is grouped together in logical order and large icons make things easily recognisable. A pop-up ‘Discover’ menu at the bottom of the screen is a bonus, and suggests top picks across broadcast and online content, while keeping your current viewing in sight. You might have to look higher up Sony’s TV range for its smart remote, but the SideView app – free to download for iOS and Android devices – shows rivals how to design an app remote. It’s handy to set up, coherently laid out and easy to get to grips with. The highlight, though, is the comprehensive EPG, which lets you view programme information and related Twitter content, and set content to record. A physical remote is provided, too, and is just as functional: logical and well spaced-out, it has useful shortcut buttons and a slim body. For a budget TV, the Sony KDL-40W605B has a lot going for it: a sharp, detailed picture, a good selection of smarts and a competitive price, added to a light and impressive design. If you’re set on a 40in TV and already have a soundbar – or the budget for one – this Sony definitely deserves a place on your shortlist.